(2) Raising Those Issues. To raise any of those issues, a party must do so by a specific denial, which must state any supporting facts that are peculiarly within the party’s knowledge. (b) Fraud or Mistake; Conditions of Mind. In alleging fraud or mistake, a party must state with particularity the circumstances constituting fraud or mistake. Malice, intent, knowledge, and other conditions of a person’s mind may be alleged generally. (h) Admiralty or Maritime Claim. (1) How Designated. If a claim for relief is within the admiralty or maritime jurisdiction and also within the court’s subject-matter jurisdiction on some other ground, the pleading may designate the claim as an admiralty or maritime claim for purposes of Rules 14(c), 38(e), and 82 and the Supplemental Rules for Admiralty or Maritime Claims and Asset Forfeiture Actions. A claim cognizable only in the admiralty or maritime jurisdiction is an admiralty or maritime claim for those purposes, whether or not so designated. (2) Designation for Appeal. A case that includes an admiralty or maritime claim within this subdivision (h) is an admiralty case within 28 U.S.C. §1292(a)(3). Note to Subdivision (a). Compare [former] Equity Rule 25 (Bill of Complaint—Contents) requiring disability to be stated; Utah Rev.Stat.Ann. (1933) §104–13–15, enumerating a number of situations where a general averment of capacity is sufficient. For provisions governing averment of incorporation, see 2 Minn.Stat. (Mason, 1927) §9271; N.Y.R.C.P. (1937) Rule 93; 2 N.D.Comp.Laws Ann. (1913) §7981 et seq. Note to Subdivision (b). See English Rules Under the Judicature Act (The Annual Practice, 1937) O. 19, r. 22. Note to Subdivision (c). The codes generally have this or a similar provision. See English Rules Under the Judicature Act (The Annual Practice, 1937) O. 19, r. 14; 2 Minn.Stat. (Mason, 1927) §9273; N.Y.R.C.P. (1937) Rule 92; 2 N.D.Comp.Laws Ann. (1913) §7461; 2 Wash.Rev.Stat.Ann. (Remington, 1932) §288. Note to Subdivision (e). The rule expands the usual code provisions on pleading a judgment by including judgments or decisions of administrative tribunals and foreign courts. Compare Ark.Civ.Code (Crawford, 1934) §141; 2 Minn.Stat. (Mason, 1927) §9269; N.Y.R.C.P. (1937) Rule 95; 2 Wash.Rev.Stat.Ann. (Remington, 1932) §287. Certain distinctive features of the admiralty practice must be preserved for what are now suits in admiralty. This raises the question: After unification, when a single form of action is established, how will the counterpart of the present suit in admiralty be identifiable? In part the question is easily answered. Some claims for relief can only be suits in admiralty, either because the admiralty jurisdiction is exclusive or because no nonmaritime ground of federal jurisdiction exists. Many claims, however, are cognizable by the district courts whether asserted in admiralty or in a civil action, assuming the existence of a nonmaritime ground of jurisdiction. Thus at present the pleader has power to determine procedural consequences by the way in which he exercises the classic privilege given by the saving-to-suitors clause (28 U.S.C. §1333) or by equivalent statutory provisions. For example, a longshoreman’s claim for personal injuries suffered by reason of the unseaworthiness of a vessel may be asserted in a suit in admiralty or, if diversity of citizenship exists, in a civil action. One of the important procedural consequences is that in the civil action either party may demand a jury trial, while in the suit in admiralty there is no right to jury trial except as provided by statute. It is no part of the purpose of unification to inject a right to jury trial into those admiralty cases in which that right is not provided by statute. Similarly as will be more specifically noted below, there is no disposition to change the present law as to interlocutory appeals in admiralty, or as to the venue of suits in admiralty; and, of course, there is no disposition to inject into the civil practice as it now is the distinctively maritime remedies (maritime attachment and garnishment, actions in rem, possessory, petitory and partition actions and limitation of liability). The unified rules must therefore provide some device for preserving the present power of the pleader to determine whether these historically maritime procedures shall be applicable to his claim or not; the pleader must be afforded some means of designating his claim as the counterpart of the present suit in admiralty, where its character as such is not clear. The problem is different from the similar one concerning the identification of claims that were formerly suits in equity. While that problem is not free from complexities, it is broadly true that the modern counterpart of the suit in equity is distinguishable from the former action at law by the character of the relief sought. This mode of identification is possible in only a limited category of admiralty cases. In large numbers of cases the relief sought in admiralty is simple money damages, indistinguishable from the remedy afforded by the common law. This is true, for example, in the case of the longshoreman’s action for personal injuries stated above. After unification has abolished the distinction between civil actions and suits in admiralty, the complaint in such an action would be almost completely ambiguous as to the pleader’s intentions regarding the procedure invoked. The allegation of diversity of citizenship might be regarded as a clue indicating an intention to proceed as at present under the saving-to-suitors clause; but this, too, would be ambiguous if there were also reference to the admiralty jurisdiction, and the pleader ought not be required to forego mention of all available jurisdictional grounds. Other methods of solving the problem were carefully explored, but the Advisory Committee concluded that the preferable solution is to allow the pleader who now has power to determine procedural consequences by filing a suit in admiralty to exercise that power under unification, for the limited instances in which procedural differences will remain, by a simple statement in his pleading to the effect that the claim is an admiralty or maritime claim. The choice made by the pleader in identifying or in failing to identify his claim as an admiralty or maritime claim is not an irrevocable election. The rule provides that the amendment of a pleading to add or withdraw an identifying statement is subject to the principles of Rule 15. The amendment eliminates the reference to Rule 73 which is to be abrogated and transfers to Rule 9(h) the substance of Subsection (h) of Rule 73 which preserved the right to an interlocutory appeal in admiralty cases which is provided by 28 U.S.C. §1292(a)(3). The reference to Rule 26(a) is deleted, in light of the transfer of that subdivision to Rule 30(a) and the elimination of the de bene esse procedure therefrom. See the Advisory Committee’s note to Rule 30(a). The amendment is technical. No substantive change is intended. Rule 9(h) was added in 1966 with the unification of civil and admiralty procedure. 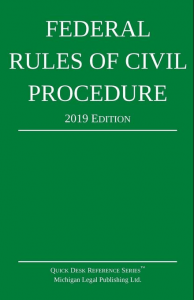 Civil Rule 73(h) was amended at the same time to provide that the §1292(a)(3) reference “to admiralty cases shall be construed to mean admiralty and maritime claims within the meaning of Rule 9(h).” This provision was transferred to Rule 9(h) when the Appellate Rules were adopted. A single case can include both admiralty or maritime claims and nonadmiralty claims or parties. This combination reveals an ambiguity in the statement in present Rule 9(h) that an admiralty “claim” is an admiralty “case.” An order “determining the rights and liabilities of the parties” within the meaning of §1292(a)(3) may resolve only a nonadmiralty claim, or may simultaneously resolve interdependent admiralty and nonadmiralty claims. Can appeal be taken as to the nonadmiralty matter, because it is part of a case that includes an admiralty claim, or is appeal limited to the admiralty claim? The courts of appeals have not achieved full uniformity in applying the §1292(a)(3) requirement that an order “determin[e] the rights and liabilities of the parties.” It is common to assert that the statute should be construed narrowly, under the general policy that exceptions to the final judgment rule should be construed narrowly. This policy would suggest that the ambiguity should be resolved by limiting the interlocutory appeal right to orders that determine the rights and liabilities of the parties to an admiralty claim. A broader view is chosen by this amendment for two reasons. The statute applies to admiralty “cases,” and may itself provide for appeal from an order that disposes of a nonadmiralty claim that is joined in a single case with an admiralty claim. Although a rule of court may help to clarify and implement a statutory grant of jurisdiction, the line is not always clear between permissible implementation and impermissible withdrawal of jurisdiction. In addition, so long as an order truly disposes of the rights and liabilities of the parties within the meaning of §1292(a)(3), it may prove important to permit appeal as to the nonadmiralty claim. Disposition of the nonadmiralty claim, for example, may make it unnecessary to consider the admiralty claim and have the same effect on the case and parties as disposition of the admiralty claim. Or the admiralty and nonadmiralty claims may be interdependent. An illustration is provided by Roco Carriers, Ltd. v. M/V Nurnberg Express, 899 F.2d 1292 (2d Cir. 1990). Claims for losses of ocean shipments were made against two defendants, one subject to admiralty jurisdiction and the other not. Summary judgment was granted in favor of the admiralty defendant and against the nonadmiralty defendant. The nonadmiralty defendant’s appeal was accepted, with the explanation that the determination of its liability was “integrally linked with the determination of non-liability” of the admiralty defendant, and that “section 1292(a)(3) is not limited to admiralty claims; instead, it refers to admiralty cases.” 899 F.2d at 1297. The advantages of permitting appeal by the nonadmiralty defendant would be particularly clear if the plaintiff had appealed the summary judgment in favor of the admiralty defendant. It must be emphasized that this amendment does not rest on any particular assumptions as to the meaning of the §1292(a)(3) provision that limits interlocutory appeal to orders that determine the rights and liabilities of the parties. It simply reflects the conclusion that so long as the case involves an admiralty claim and an order otherwise meets statutory requirements, the opportunity to appeal should not turn on the circumstance that the order does—or does not—dispose of an admiralty claim. No attempt is made to invoke the authority conferred by 28 U.S.C. §1292(e) to provide by rule for appeal of an interlocutory decision that is not otherwise provided for by other subsections of §1292. GAP Report on Rule 9(h). No changes have been made in the published proposal. Rule 9(h) is amended to conform to the changed title of the Supplemental Rules. The language of Rule 9 has been amended as part of the general restyling of the Civil Rules to make them more easily understood and to make style and terminology consistent throughout the rules. These changes are intended to be stylistic only. Rule 15 governs pleading amendments of its own force. The former redundant statement that Rule 15 governs an amendment that adds or withdraws a Rule 9(h) designation as an admiralty or maritime claim is deleted. The elimination of paragraph (2) means that “(3)” will be redesignated as “(2)” in Style Rule 9(h).